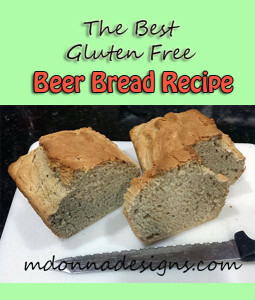 Going gluten free was hard enough, but giving up our family’s favorite Beer Bread recipe was tough. In a quest to create gluten free bread, I tried recipe after recipe, tweaking ingredients each time. 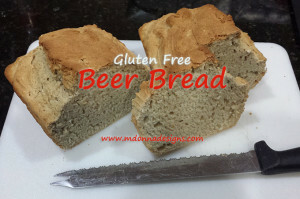 Finally, after finding the perfect mixture of various flours, I finally came up with a wheat free beer bread that has the right taste and texture that satisfied our craving for delicious bread. Cut thick slices for a satisfying side dish with any meal, or cut thin slices to make a delicious (although crumbly) wheat free sandwich bread. For a delicious party dish, cut into chunks and serve with your favorite dip. It’s a tasty twist on an old recipe. 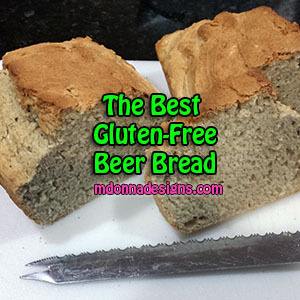 For the best results, use a pale gluten free beer that has a subtle flavor. For a different treat, use an alcoholic cider made by the beer companies. Enjoy! 1 bottle of gluten free beer, 12 oz. 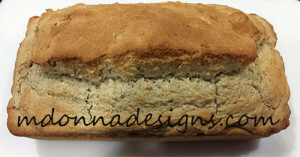 Spray a stoneware loaf pan with gluten free spray oil. Add all the dry ingredients to a large bowl. In a separate bowl, whisk two eggs together and then add to the dry ingredients. Pour the beer into the bowl, and stir until all ingredients are combined. Bake for 1 hour. The bread is done when a toothpick inserted in the center of the beer bread comes out clean. « Going Gluten Free: How Do I Do It?